After months of planning to get here and weeks of work, both in the field and the lab, team G-062 has finally generated the first next-generation DNA sequence data in situ on the seventh continent from samples collected right here in Antarctica. This story begins on the morning of December 10, 2016 when the five of us boarded a Bell 212 helicopter and set off from McMurdo base across the Ross Ice Shelf, destination: the Dry Valleys. After a 45 minute flight our pilot dipped the helicopter into Wright Valley and dropped us off on the shore of Lake Vanda, a 5km long, 69 meter deep hypersaline lake with a salinity 10 times that of seawater. There, high above the shore, we dug into sediment that at one time was a lakebed covered in water, but dried up two or three thousand years ago as the lake receded. At a depth of roughly 10 cm under the surface we discovered ancient microbial mats that had once lived happily in their watery environment, but had since desiccated and been buried as the water receded. Were any of these cells still alive, hunkered down and biding their time? If so, how were they doing it – how could they survive? There was only one way to find out. We collected the samples, flew them back to our lab at the Crary Science Center and isolated DNA from cells that had not seen the light of day for a very long time. 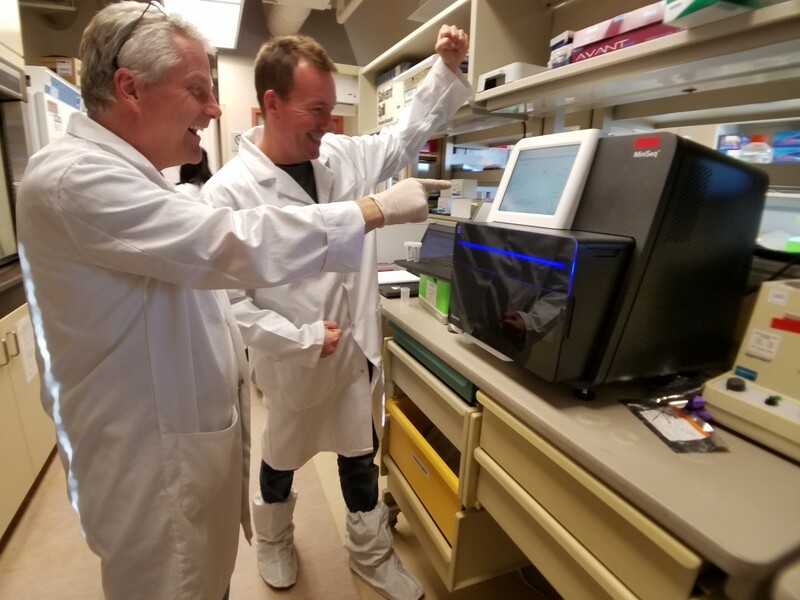 We assessed the DNA quality on our trusty Agilent Bioanalyzer, and successfully constructed paired-end 150-bp libraries from the ancient DNA using Illumina Nextera XT chemistry. We chose a single sample to perform massively parallel sequencing of millions of DNA fragments on the Illumina MiniSeq sequencing system housed in our lab space at Crary. After nearly 24 hours the sequencer delivered our first run results: 8.1 billion base-pairs of data at a cluster density of 166K/mm2, with 92.7% of clusters passing filter (>Q30). Not bad. We’re slowly (very slowly) offloading some of this data from the continent to do more sophisticated bioinformatics than our laptops allow down here. We’ll analyze most of this data back home, but we’re eager for a quick look as soon as we can get one! Figure 1. First MiniSeq metagenomics run. This entry was posted in Antarctica 2016 on December 15, 2016 by David Goerlitz.